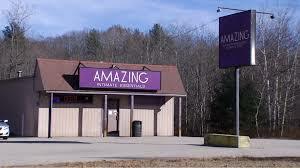 KITTERY, Maine — The Town Council could decide to levy a fine, suspend or revoke Amazing Intimate Essential’s viewing booth license in a disciplinary hearing Wednesday at 6 p.m. at Town Hall. Police Chief James Soucy on Nov. 9 was completing a viewing booth compliance check for the second time in as many days and discovered two men “engaging in indecent conduct together” in the same booth. They were issued citations for indecent conduct. Soucy said there was also a man zipping up his pants and running out of a separate booth when police visited the store Nov. 9. To read the rest of the story, click the link above to visit the Portsmouth Herald. Here is the last years article. This entry was posted in General Town News on January 17, 2018 by Chuck Denault.